We are proud to announce that Service Works has been recognized by Sika Sarnafil with their National Project of the Year. 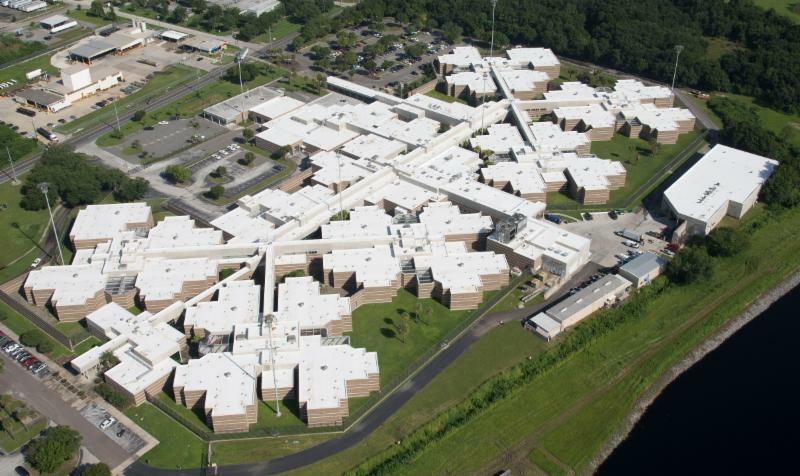 The Orient Road Jail located in Tampa, FL is classified as a high security facility with a capacity of over 500 inmates. The project consisted of 17 buildings and 152 separate roof sections. The successful completion of the project was a combined effort by the jail management, CMC Roof Design, and Service Works skilled management and installation crews. Great Job! To ensure that a roof like what was installed on the jail delivers its maximum life will require periodic roof inspections. The National Roofing Contractors Association recommends two inspections a year, or after any severe weather event. Any roof inspection should start with a checklist of the items that typically require maintenance and are prone to deterioration. All manufactures warranties require that the Owner provide periodic roof inspections and maintenance. Read further in the newsletter to find out more on these subjects. Roof systems can deteriorate from normal wear, severe weather conditions, building movement, improper design, and lack of maintenance. Any roof repair not dealt with after the first signs of failure can result in increased damage to the building envelope and interior finishes, along with loss of occupant productivity. Failure of structural integrity can endanger occupant safety. Regular inspections of a building roof system will lead to early detection of roof problems, protection of capital assets, and maintenance of a safe working environment of the building occupants. Any roof inspection program should start with a comprehensive checklist. This checklist will determine if the roof system is preforming according to its intended function, it will identify any signs of weakness, deterioration, or hazard, and will help to identify any needed repairs. A project recently completed by Service Works, The Orient Road Jail, was recognized as the National Project Of The Year by Sika Sarnafil. The project schedule was over a year and a half and included some impressive facts. The project included 17 buildings, 152 different roof levels, and over 376,000 square feet worth of Sika Sarnafil's S327 PVC membrane. There were over 7 miles of wall flashings, almost 5 miles of edge metal, and over 750 plumbing pipe penetrations. Congratulations to the Project Management, Operations, and the installation crews on a project well done.